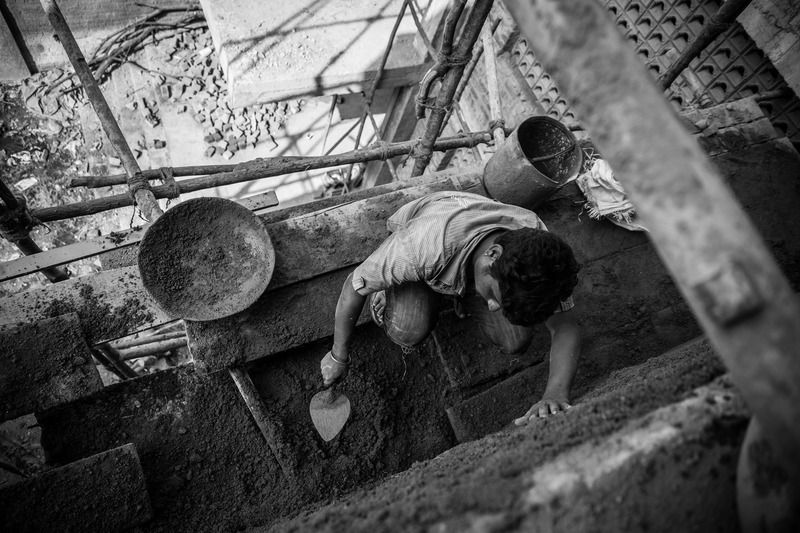 A construction worker in Chennai. The recent accidental deaths at Saidapet metro-rail construction site and a building construction site in Egmore bring forth serious questions about safety measures at construction workplaces across the city. On January 12 , 20-year-old migrant construction worker, Ranjith Biswal from Odisha, lost his life when a 70-tonne crawler carrying a 22-tonne load came crashing down on him at the Saidapet metro construction site. Another worker, 19-year-old Tira Naik, was severely injured and had his left leg amputated. Last December, a migrant construction worker was killed and three others seriously injured when a lift carrying the four malfunctioned and snapped at a Larsen and Turbo (L&T) construction site on Ethiraj Salai in Egmore. After the Saidapet accident, the inquiry carried out by Gammon India (the company, in a joint venture with Moscow-based OJSC Mosmetrostroy, is constructing the metro rail station) laid the entire blame on the crane operator, without any mention of safety aspects at the site. As for the Egmore incident, nothing has come out of the police investigation yet. However workers and unions have a different view on the safety measures implemented at construction sites. “The safety measures taken at the construction sites of Chennai city are not up to the mark. In most sites, in fact, they are greatly flouted, and that’s why accidents occur with such frequency,” said C Srinivasan, former construction worker and general secretary (south Chennai) of the All India Trade Union Congress (AITUC). “To find out how safety regulations as laid down by the government are flouted in such accidents, a detailed investigation needs to be done. In the L&T site accident, we have to look into maintenance of the lift and the possibility of overloading,” says Geetha Ramakrishnan, advisor to the Unorganized Worker’s Federation (UWF). She is also the All India Additional Secretary of the Nirman Mazdoor Panchayat Sangam (NMPS), a union that organizes and fights for the rights of construction workers nationally. Construction companies’ claim that they provide basic safety gear and conduct regular classes on safety precautions contrasts sharply with the spike in the number of reported accidents at different sites across the city. According to a recent report in The Times of India, about 100 migrant workers have died in construction sites in greater Chennai itself in the past two years. Thakur, who had worked for L&T in Chennai last year, adds that in spite of the regulatory measures accidents occur mostly because of lack of alertness of the workers.“Working at construction sites is full of hazards. Obviously there are risks, like dangerous unmanned pits, deep excavations with inadequate slopes, and live wires lying unnoticed on ground. It all depends on how alert we are,” he says. Labour union activists, however, believe that the safety equipment provided to the workers is not technically sound. The difficulty in getting adequate compensation after such an accident in construction sites has raised concern among activists. Though allegations are made on how ineffective the state government’s Labour Department is and how cumbersome it is to overcome the bureaucratic hurdle to get the compensation amount, the primary blockade in receiving compensation is that most accident victims are migrant workers. “The compensation in case of an accident can be worked out only if the worker is registered . And it’s quite a difficult task for a migrant worker to get registered in Tamil Nadu,” says Srinivasan. Apart from language and registration problems, even the political framework for getting compensation is not strong enough. The compensation for both dead and injured workers, feels Geeta Ramakrishnan, should come from a strong administrative policy and not sporadic government funds, or settlements made outside Labour Commissioner’s overview. “Any kind of monetary settlement made by a construction company with the victim’s family without the knowledge of the Labour Commissioner is illegal. The compensation should have been computed as per the provisions of Workmen’s Compensation Act and handed over only in the presence of Labour Commissioner,” Ramakrishnan added. The rights of construction workers in India are consolidated primarily by the Building and Other Construction Workers (Regulation of Employment & Conditions of Service) Act, 1996. The Act, most importantly, outlines the responsibilities of employers to ensure safety of the worker and prevent accidents. Compensations are to be calculated on the basis of the Workman’s Compensation Act, 1923 (amended in 1984 and 2000). Along with it, the Minimum Wages Act, 1948; Contract Labour (Regulation & Abolition) Act, 1970; Inter-State Migrant Workmen Act, 1979 are also applicable to construction workers. The Tamil Nadu Building and Other Construction Workers Rules, 2006, issued in accordance with sections 40 and 62 of the BOCW Act lays down succinctly the important safety regulations to be followed in any construction site in the state. But activists feel that even as the legal provisions for seeking justice are on paper, the reality on the ground is quite different. “The problem is the implementation of the laws and state government Rules. There is plenty of room for improvement in the manner in which various government bodies deal with construction site accidents and safety issues of the workers,” says Senior Advocate V. Prakash, honorary president of United Labor Federation (ULF). This article appeared on the Volume 1, 2014 of the Asian College of Journalism’s Lab Journal The Word, and on the Tamil Nadu Labour Blog.